My husband has faithfully stored this bulk load of Agee jars for many years, with the hope that one day I would get into preserving. I was brutally honest last week and told him that I really don't have time for this dream (and neither does he) and I want the blessed things out of my basement. Now! So if preserving is your dream or the dream of someone you know (and you are not into bringing dreams crashing down) then get yourself a bargain with this massive load of preserving jars. Most are the bigger size (think delicious peaches or apples sitting on the shelf in your pantry - or that's what he was thinking. I would prefer a shelf of chocolate, personally) but there are a few of the smaller size (jams or chutneys?). Also come with a number of rings, some needing a good scrub. 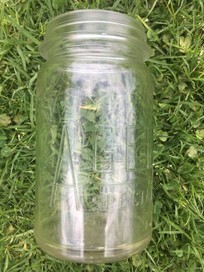 Some jars have coloured tissue around them (not from his tears of frustration but from being used as candle holders at a wedding). Obviously some also dusty from my years of refusing to get into preserving. Pick up only. Beach Haven.